Everyone should be rewarded for a job well done! Children need positive reinforcement especially when making healthy changes that do not feel comfortable to them at first. 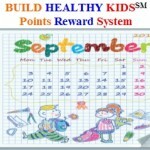 One way to help your child stick with the Build Healthy KidsSM program and continue to make healthy choices is to use a points reward system. What is the points reward system? It is a calendar or chart that you keep on your refrigerator that you use to encourage and reward your child(ren) for every positive change they make to their diet or activity habits. Children receive points or stickers for positive behavior. (Younger children may like stickers while older children prefer points). Both you and your child review their calendar/chart each night and discuss how well they did. A good day earns them 10 points. Each month a child can earn up to approximately 300 points (number of days in the month x 10 points) by making healthy choices. Before the month begins, you sit down with your child and determine the prize that they will earn at the end of the month. If your child scored below 100 points they would not earn a prize and they would need to repeat the month. 100-200 points earns your child a small prize and 200-300 points earns them a big prize. Together you can select a prize that serves as a major incentive for each group. Be really inventive and be sure to pick a prize that they really want. If money is an issue, create a prize that costs nothing. Below are some examples. Repeat this for each month. If you require day to day guidance, sign up for the Build Healthy KidsSM course online at http://www.buildhealthykids.com/blog/build-healthy-kids-course/ and join a community of parents who are changing their child’s eating and exercise habits, one choice at a time. 5 points are earned for each day that your child eats any whole grain bread and 5 points are earned each day when they eat no processed/white flour bread. Goal: eat no processed bread by weeks end. Stick to whole grain breads and earn 5 points each day your child’s breakfast has at least one serving of whole grains and 5 points are earned each day they ate no processed grains for breakfast. If they eat any processed products at breakfast then deduct 2 points for each processed grain product they ate that day from the day’s total. Keep up the whole grain bread and whole grains at breakfast. 5 points are earned each day your child eats whole grain at lunch with no processed grains and 5 points are earned each time they eat whole grain at dinner and no processed grain. If your child eats any processed bread or breakfast item deduct 2 points for each occurrence. Keep up the whole grains for bread, breakfast, lunch and dinner. Each day your child eats only whole grains at snack time and no processed grain at snack they earn 10 points. Each time they eat processed grains any time during the day 2 points are deducted for each occurrence from the month’s total. If your child is not drinking 100% juice, switch now. They earn 5 points each day they drink 100% juice and no juice drinks (not 100% juice). They also earn 5 points each day they limit juice consumption to: Age 2-4 yrs: 4 oz, Age 4-6 yrs: 6 oz, Age 7-13 yrs: 8 oz, Age 14-18 yrs: 12 oz. Goal at the end of week one is to be drinking only 100% juice and no more than the daily recommendations. Make sure your child is eating at least one whole fruit a day. Your child earns 10 points each day they eat at least one whole fruit. Continue drinking only 100% juice within age appropriate limits. Subtract 2 points if juice drinks were consumed and subtract 2 points for each 2 oz young children (6 yrs and younger) exceed their limit and subtract 2 points for each ½ cup older (7 or older) children exceed their juice limit. Remove fruit strips, fruit roll up, fruit gummies, fruit leather and all soft processed fruit products. Children earn 5 points each day they eliminate these products and 5 points each time they eat a whole fruit. Continue limiting juice, drinking only 100% juice and eating one whole fruit a day. Your child loses 2 points each time they go over their juice limit, drink juice drinks, or don’t eat their whole fruit. 5 points are deducted each day for each gummy fruit snack consumed during this week. Your child earns 5 points for the first whole fruit they eat and 5 additional points for the second whole fruit they eat (if they eat more, praise them but the points stop at 10). 2 points are deducted each day for drinking fruit drinks, eating gummy fruit snacks, exceeding their limit, or not eating any whole fruit. o	Week 1: Replace an unhealthy morning snack with a healthy snack. For each day this week that he/she does not eat an unhealthy snack in the morning give 5 points, for each morning a healthy snack is consumed give another 5 points. If no snacks are consumed in the morning your child will earn 10 points each day no treats are eaten in the morning for this week. o	Week 2: Keep up the healthy morning snacks. Replace unhealthy afternoon snacks with a healthy alternative. This week your child can earn 5 points a day when they eat a healthy afternoon snack and another 5 points each day they do not consume an unhealthy snack in the afternoon. o	Week 3&4: Keep up the healthy morning and afternoon snacking. For weeks 3 and 4 your child will earn 5 points each night they have a healthy after dinner snack and another 5 points a day when they do not eat an unhealthy snack after dinner. If no snack is consumed after dinner than during week 3 and 4 your child will earn 5 points for a healthy morning snack and 5 points for healthy afternoon snack. o	Step 1: Reduce the amount of red meat (pork, beef and lamb) by one serving a day until your child is consuming no more than one red meat serving a week. If they are not eating more than 1 serving a week now, go right to step 2. Earn 10 points each day you reduce the amount of red meat in your child’s diet. o	Step 2: Switch from processed protein to a healthy protein source and reduce to one serving a week. Processed protein includes cold cuts with nitrates or nitrites, sausages, bacon, hot dogs, beef jerky. Replace cold cuts with nitrate/nitrite free chicken or turkey cold cuts, sausages with chicken sausages and purchase nitrate/nitrate free hot dogs and bacon. The goal is to consume no more than one serving a week of hot dogs, sausages and bacon (nitrtite,nitrate free poultry is OK more than once a week). Earn 10 points each day you reduce the amount of processed meat in your child’s diet or replace an unhealthy source with a healthy source. Go to step 3 when your child is eating none or one processed protein a week. o	Step 3: Add a legume to your child’s diet once a day. Legumes include: beans (white, navy, pinto, lima, kidney), chickpeas (hummus), peas, lentils. Your child will earn 10 points for each day that he or she eats a legume. o	Step 4: Add fish to your child’s diet twice a week. Canned salmon makes a great sandwich instead of tuna fish. Your child earns 10 points each time they eat fish and 10 points each day they continue to eat legumes and limit red and processed meat until months end. o	Step 1: Start to reduce the amount of times your child eats fast food: pizza, burgers, hot dogs, Mexican fare that is fried and cheesy, and other fried dishes, until they are only eating 1 serving a week. Earn 10 points each day your child does not eat fast food. When your child is eating fast food no more than once a week, go to step 2.
o	Step 2: Remove the skin off of poultry and the visible fat off of red meat products that you cook at home. 10 points for each day that your child doesn’t eat fried food, pizza with regular cheese, the skin on poultry and the visible fat on red meat, minus 5 points each time they do. Go to step 3 when you are no longer frying food, or serving meat with the skin or visible fat. o	Step 3: Continue with the changes made in step 1 and 2. Switch to low fat dairy products: cheese, milk and yogurt. Earn 10 points each day that low fat dairy is served, minus 5 points each time a whole fat dairy product is consumed. Go to step 4 when your child is consuming low fat dairy products. o	Step 4: Replace butter and trans fat products with vegetable oils. Earn 10 points for each day your child avoids, fried food, whole cheese pizza, and fatty meats, plus consumes low fat dairy. o	Step 5: Limit grain based desserts (pie, cake, cookie) and whole fat ice cream to no more than once a week. Earn 10 points each day one of these treats/dessert is not consumed plus continues to follow the instructions in step 4. Minus 5 points each time a full fat food is consumed. •	Step 2: Start to reduce sweetened drinks and replace with water or milk. Your child earns 5 points each day they reduce the sugar sweetened beverage and 5 points a day are earned for drinking at least 2 glasses of water and 2 glasses of plain milk. 2 points are deducted for each sugar sweetened beverage consumed after the goal was reached. For instance if you replaced flavored milk with plain milk in week 1 than during week 2 through 4 your child would lose 2 points every time they drank a flavored milk product. o	Step 1: Determine the amount of time that your child engages in sedentary/ electronic behavior. This includes hand held devices, computers (homework not included), TV, video, and other entertainment devices that require a battery or plug. The Goal is for children to limit their electronic time to 1 to 2 hours a day. Calculate the difference between the amount of time your child currently engages in these behaviors and their goal. Divide this number by 21 days and reduce their electronic time by that amount (increments of 15 minutes works best) each day. Write their daily limit/goal on the calendar. o	Step 2: For the first 3 weeks, your child earns 10 points each day they limit their electronic time to their daily goal. 2 points are subtracted for each 15 minutes they exceed their time. o	Step 3: During week 4 have your child earn their 1 or 2 hours of sedentary time by exercising first. 1 hour of exercise or playing outside earns them 60 minutes of electronics. No roll over minutes apply. It is a use it or lose it policy. Children earn 10 points each time they earn their minutes. 2 points are subtracted for each unearned 15 minute time period or 15 minute over the daily limit. o	Step 1: Focus on the cans in your home and replace those that have more than 140 mg of sodium a serving with a lower salt alternative or make your own soup, macaroni product or other high salt processed product. Plus stop salting dishes at the table (it is OK to add salt when cooking as long as it is a moderate amount). Earn 10 points each day your child does not consume a high salt canned food or salts their food. Move on to step 2 when this no longer occurring. o	Step 2: Focus on prepared meals next (pizza, tacos, burgers, beef dishes, pasta dishes chicken dishes), as they often have lots of salt added to them. Your best bet is to prepare meals at home or dilute the prepared dish with steamed vegetables. Do not eat prepared meals high in salt more than once a week. Earn 10 points each day your child does not eat a high salt prepared meal (more than 140mg per 100 gram of food) and minus 5 points when they do, also deduct 5 points when they consume regular cheese, pizza and canned goods high in sodium. o	Step 3: Replace high salt cold cuts and other processed meats (bacon, sausages, ribs) with low sodium varieties. Earn 10 points a day that your child consumes no high salt canned food, prepared meals and cold cuts. Deduct 5 points each time they consume a high salt food in these categories. Go to step 4 when your child is earning 10 points on at least 5 of the 7 days a week. o	Step 4: Yeast bread is the 3rd largest contributor to salt in a child’s diet. Replace high sodium bread with those that provide no more than 140 mg of sodium per serving. Earn 10 points when all the steps are followed each day and deduct 5 points for each high salt dish or product consumed. Continue until your child is earning 10 points on at least 5 of the 7 days. o	Step 1: Add one serving of vegetables to your child’s lunch if he or she does not regularly eat a vegetable with lunch. Earn 10 points each day a vegetable at lunch is eaten. When your child eats a veggie every day at lunch go to step 2.
o	Step 2: Add a vegetable at snack time, cut up raw veggies with dip are a favorite with kids. Earn 10 points each day a second serving of vegetables is eaten. When your child regularly eats 2 servings of vegetables go to step 3.
o	Step 3: Add a 3rd serving of vegetables at dinner. Earn 10 points each day your child eats 3 vegetable servings until the end of the month (if more time is needed to reach the goal, continue until 3 servings of vegetables a day is eaten). •	Week 1: Determine the amount of exercise your child engages in a day and increase it each week by 15 minutes, or start at 15 minutes if they do not already run and play or partake in an organized sport each day. Check with your child’s pediatrician first if there is concerns. Your child earns 10 points each day they exercise 15 minutes. o	Step 1: Earn 10 points each day at least 1 serving of low fat or fat free milk or milk alternative fortified with calcium is consumed. Go to step 2 after your child regularly consumes 1 serving of a high calcium drink or food. o	Step 2: Add another serving of a calcium rich beverage or food (remember to limit juice to 1 serving a day) each day. Earn 10 points each day that 2 servings of a calcium rich food/drink is consumed. For children 2-3 years of age stop at 2 cups of milk a day and jump to step 4, for children 4 to 8 increase to 2 ½ cups and than go to step 4, and for children 9 years and older go to step 3.
o	Step 3: Add another serving of dairy or a dairy alternative. Earn 10 points each day that 3 servings of low or non fat dairy is consumed. Once there, go to step 4.
o	Step 4: Make sure your child gets their 400 IU’s of vitamin D a day. Your child earns 10 points each day they get their 400IU’s of vitamin D a day until the end of the month. o	Week 1 and 2: Add one more “dinner together” night when your entire family eats dinner together. If your spouse or you get home too late for younger children to eat together, give them a snack when you eat later. Earn 10 points each night you eat together as a family. On nights that you don’t eat together at dinner, eat together at breakfast or lunch. Earn a maximum of 10 points each day when at least one meal a day is eaten together. o	Week 3: Continue with eating meals together. This week, make sure your child sits down to a healthy breakfast. Earn 10 points each morning your child eats a healthy breakfast. o	Week 4: Continue with the healthy breakfast and dinners together. Add on the following: have your child either pick out a meal, shop with you at the grocery store (without whining) to pick out ingredients for a meal, or helps you prepare a meal. Earn 10 points each day your child is involved in the shopping, selection, or preparation of a meal.